I know I am not alone in finding myself wishing for the brown earth to start sprouting little sprigs of luscious green! This is the color of life, vitality and growth. 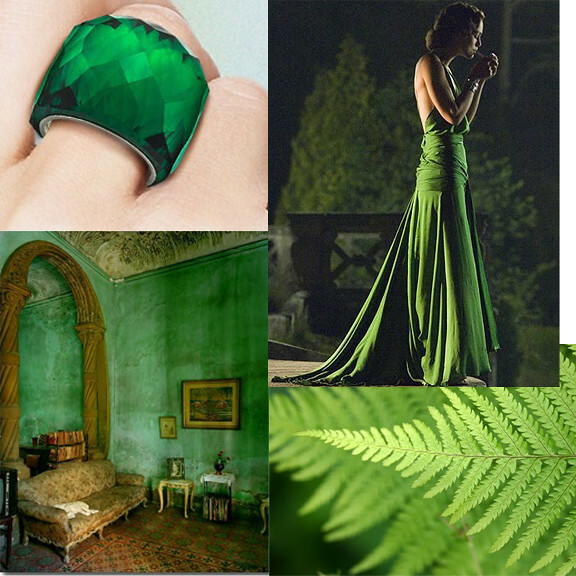 It can inhabit such a lovely variety of hues and texture from mossy foliage to hard emerald gemstones or liquid viridian silk. 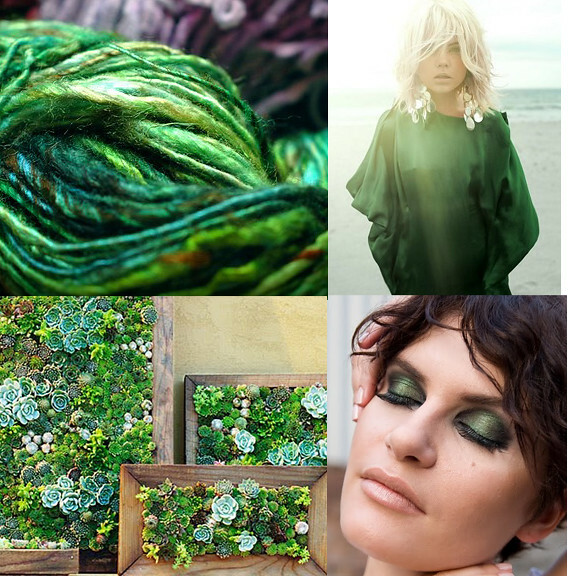 I am inspired to add pops of this color to my wardrobe, and dreaming of the day I can feel the lush grass squidge between my bare toes! 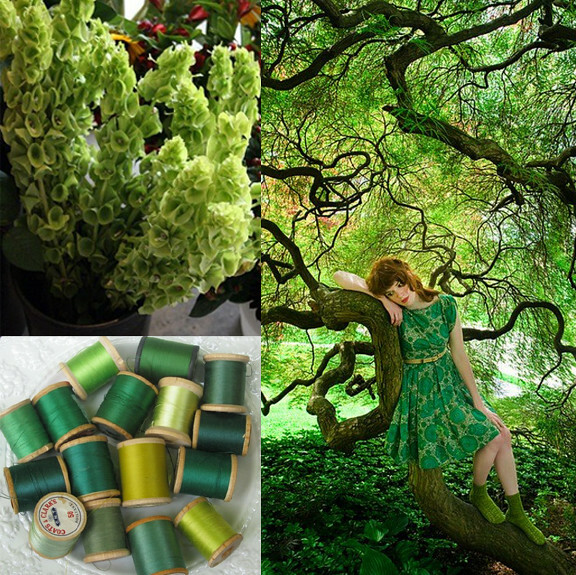 How does green inspire you? I let out a gasp at the lushness of this collection. I love that little happy Hawaiian at the bottom! It is hard to think green when my landscape is a stark contrast of blacks and whites. It is stark, flat, uninviting. These greens say welcome. Thanks for the color inspiration! Enjoy the day! P.S. How did you do this? And where do you find all these images? They are awesome! I love this post and all the wonderful imagery. I love you for giving me this inspiration. Thank you for the kind comments! I've found that creating these color boards helps my own creative process, and I am happy to share! 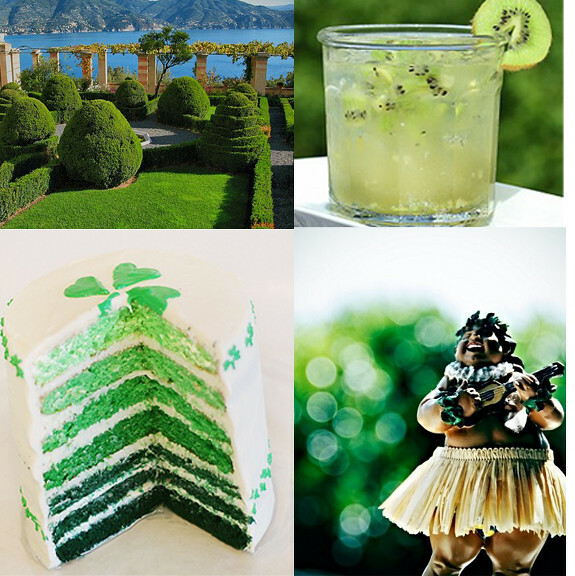 Oh how I miss GREEN - I can't wait - we are surrounded by trees and the winter is so morose! In the spring and summer it fills in and the kids play in the back and birds chirp and windows are flung open and like is good! Beautiful montage there my friend! So lush and lovely! I can't wait for spring either. Mmmmm I can smell it! Thanks for the inspiration! What inspiring images...a feast! I love Green. It's the color I wear most and I have hazel eyes that (so my boyfriend says) flash green when I get really made. I also love the colour because it's the colour of the heart chakra, the seat of love, for ourselves and others and when I meditate on love I try to visualize a green light enveloping my heart or the heart of someone else. :) Think I'm going to have to go barefoot on some grass today! Green is such a great color. It inspires me because it's a fresh, calming color. Can't wait to see it and smell it on my land.